The province of Catamarca has more than a 70% of its surface covered of mountains, and this fact suppose important minerals resources.Since the Colony period, significant mineral richness was quarried, and in a particular and intense way during the second half of the XIXth century and the first half of the XXth.The vast region, acknowledged in the west, is situated between the Hualfin region (direction SW-NE) and the line that joins Corral Quemado with the ancient gold mines of Culampajá to the west. 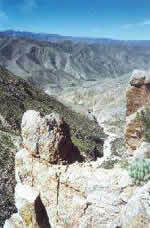 This region, includes two important areas: "Papachacra" and "Cerro Alto de las Minas". In these areas, the existence of minerals has been proved: 1. Metalliferous, such as wolframite, scheelite, columbite, cassiterite, argentiferous galena, etc. 2. Non-Metalliferous minerals, such as fluorite, topaz, quartz, feldspar, etc. The presence of these products, figures in numerous registered mines.Up to the 70th, the mineral activity was limited and poor and all the mining work was centered just in metalliferous products.Since the 80th, and as a consequence of several works supported by geological studies, very important deposits of precious stones and minerals, were discovered in all the region, and particularly in Papachacra Formation. The minerals and stones found in these regions, are considered valuable for collectors, museums and for people who use these materials in ornamentation, etc.Since then to now, all the mining activities are sporadic and practically handmade because of the lack of investment, credit and financing from the government as a consequence of the lack of knowledge or vision about the importance and the possibilities that the mining activities offer. The granite stock of Papachacra Formation is a geological structure that counts with the deposit and mines which exploitation is followed. It is located at 75 km straight to the N of Belén (Catamarca province, Argentina).The access to this place from Belén is possible through the National Route Number 40 that takes to the region of El Eje (47 km), then, from there, through the Provincial Route Number 53 that takes you to Puerta de Corral Quemado (19 km), an finally through the Provincial Route Number 36 that is at 17 km of Corral Quemado.In all these distances, the paths and roads are in good conditions. But the 20 final km to the settlement of Papachacra to the N, present irregular surface and difficulty to access. This section must be done with an special van (4x4). The granitic stock of the Papachacra Formation, in his western side (Cerro León Muerto), has an slightly oval form, with the ready greater axis southern, and their approximate limits are: the river La Cuesta by the N, la Quebrada del río Blanco (El Cajón) by the S, the town of Papachacra by the E and the place Pampa de Arrimo by the W. Belong to the system of the Sierras Pampeanas has an approximated height of 3,100 m. It's fitted within the ortogneis of Chango Real Formation, and it's a white-pink granitic rock of medium granular texture. It is made up of quartz, plagioclasa (An 16-22), orthoclase, biotite, muscovite, tourmaline, topaz, fluorite and darks.This stock was put under a process of deuteric alteratiot, due to volatile rich fluids in, like formation of miarolas filled up with ideomorphs crystals of potassium feldspar (microcline), smoked quartz, muscovite, topaz, florencite(Ce), tourmaline, etc. These processes of alteration demonstrate in addition in sequels to silicitation, to which they add a noticeable caolinization of minerals of first generation and cataclastics phenomena. With agreement to its modal composition can be classified to this rock like a monzogranito, in the limit between subalkaline granites and alkalines. The isotopic datings made, K/Ar, throw a 117 age of m.a. (± 20 m.a. ), corresponding to the inferior Cretacious. The genetic phenomenon and the subsequent hydrothermal alterations derived in crystallization an re-crystallizations that gave to the Formation exceptional richness in the mineral variety and also in the different shapes of the crystals. There are some kind of them that have a very important and valuable gemology quality.The topaz of this region has a high level of transparency and purity, and also, a great variety of colours (yellow, orange, chestnut, colourless, etc.) that make possible the cutting and carving of stones of great value.Something similar happens with the varieties of quartz, where you can find smoked gems, citrine, and amethyst. The fluorite, other kind of stone of gemology interest can be found in different colours, like violet, green, and transparent rose.The others minerals, those that have not gemology value, present crystallinar perfect shapes in exceptional sizes that can also occur naturally combine in a same single piece, fact that gives it an inestimable value (for collectors and museums).